Abolitionist leader Frederick Douglass was born into slavery in Talbot County, Maryland. He became one of the most famous intellectuals of his time, advising presidents and lecturing to thousands on a range of causes, including women’s rights and Irish home rule. Among Douglass’ writings are several autobiographies eloquently describing his experiences in slavery and his life after the Civil War. Frederick Augustus Washington Bailey was born into slavery in Talbot County, Maryland, around 1818. The exact year and date of Douglass' birth are unknown, though later in life he chose to celebrate it on February 14. Douglass lived with his maternal grandmother, Betty Bailey. 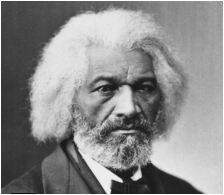 At a young age, Douglass was selected in live in the home of the plantation owners, one of whom may have been his father. His mother, an intermittent presence in his life, died when he was around 10. Frederick Douglass was given to Lucretia Auld, the wife of Thomas Auld, following the death of his master. Lucretia sent Frederick to serve her brother-in-law, Hugh Auld, at his Baltimore home. It was at the Auld home that Frederick Douglass first acquired the skills that would vault him to national celebrity. Defying a ban on teaching slaves to read and write, Hugh Auld’s wife Sophia taught Douglass the alphabet when he was around 12. When Hugh Auld forbade his wife’s lessons, Douglass continued to learn from white children and others in the neighborhood. He had a very humble beginning. He was bi-racial but he never knew his white father. started the Tuskegee Institute. 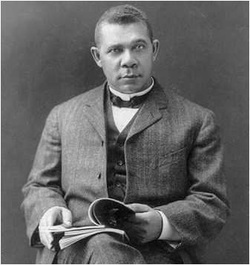 He was an eloquent speaker and used this skill for the benefit of Tuskegee Institute. The school continued to grow. All students at the school were required to work in addition to their academic* studies. They chopped trees, cleared land, made bricks, built furniture, and constructed buildings. Classes were started to teach trades and professions. In 1895 he was invited to give a speech at an Exposition in Atlanta. In it he urged blacks and whites to work together. Afterward Harvard University gave him an honorary degree. Friends gave money for Booker and his wife to visit Europe where they had tea with Queen Victoria. Henrietta was a black woman who died of cancer in 1951. When scientists began research with her tissue they discovered the cells did not die, even though cells in the lab generally died after a short while. Using these "immortal" cells Jonas Salk developed polio vaccine, experiments in space were done, and many advances were made in the field of medicine and pharmaceuticals. 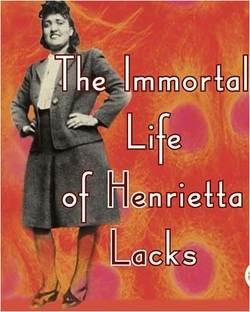 Rebecca Skloot wrote a book about Henrietta in 2009, The Immortal Life of Henrietta Lacks" of which was made into a movie and is to be released in 2013. Peaceful marches were organized and people were arrested because they were taking part in Mr. King’s beliefs of equality for all. Even little children were sprayed with water hoses and arrested! On August 28, 1963 Martin Luther King and other leaders led a march into Washington D.C. Over 200,000 people marched from the Washington Monument to the Lincoln Memorial. It was here Dr. King delivered his "I Have a Dream" message. In 1964 he was awarded the Nobel Peace Prize in Norway. He gave the $54,000 prize money to the civil rights groups which were working to secure the rights blacks deserved. Dr. King was put in jail 30 times for his resistance. Some people tried to kill him. Then on April 4, 1968 a gunman did murder him in Memphis, Tennessee. His widow Coretta Scott King passed away January 30, 2006. Harriet was born around 1820 in Maryland. Her parents were slaves, so she also was a slave when she was born. She had to work even when she was a little child. When she was twelve years old, she suffered a serious injury when an overseer threw a heavy weight which hit her in the head. Harriet married John Tubman at the age of 25 and went to work on the “underground railroad”. She made nineteen trips as a "conductor", risking her life every time, and successfully freed about 300 slaves. She carried a gun and threatened any slave who wanted to turn back. A reward of $40,000 was offered to any bounty hunter who brought Harriet in to the authorities, but she managed to avoid capture. She was such a brave woman! Harriet became known as "Moses" because she was freeing her people just as Moses freed the children of Israel from Egyptian slavery. She made friends with many influential* people including abolitionists* John Brown and Frederick Douglas. She befriended Senator William H. Seward from New York. He and his wife provided a house where she moved her parents down from Canada. She later was able to buy the home and stayed there when she was not on the road helping slaves escape. The year was 1761 and the schooner*, Phillis, was about to leave Africa. The captain, Captain Gwinn had ordered that no children should be on his ship however, among the captives being taken aboard there was a small African girl who had been kidnapped from her family. The nameless child was dressed only in a soiled piece of carpet. When the ship arrived in Boston, Susanna Wheatley went aboard to pick out a slave to help her. She had planned to buy a woman slave, but she took pity on the poor little waif* who was about seven years old and bought her instead. She named her "Phillis" after the name of the ship which had brought her to America. The Wheatley family was wealthy and lived in a mansion on a busy street in Boston. Phillis was treated well and in fact the family treated her like a member of the family. She ate at the table with them, had her own room in the attic, and did not have to do the chores the other slaves were required to do. Susanna had an 18-year-old daughter Mary and she became Phillis' tutor. She taught Phillis to read and schooled her in geography, astronomy, history, the Bible, and classic literature. She even taught her Latin and Phillis could read books written in Latin. It was as if Mary had taken a precious jewel and polished it until it shone brightly. 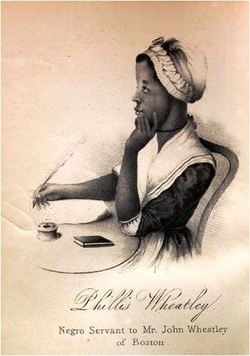 In time the slave girl became possibly the most educated woman in Boston. She learned to write and would correspond with people, even famous people of the day. Phillis became a poet. She wrote a wonderful poem called "To His Excellency General Washington" and sent the general a copy of it. He referred to her as a "poetical genius". Four months later she received an invitation from General George Washington to come for a visit. They met for about thirty minutes. Washington's secretary sent the letter to the Virginia Gazette and it was published in the newspaper on March 20, 1776. Hiram was a minister in the African Methodist Episcopal Church (AME), college president and a politician. He was the first person of color to serve in the United States Senate, and in the U.S. Congress overall. He represented Mississippi in 1870 and 1871 during Reconstruction. During the American Civil War, he helped organize two regiments of the United States Colored Troops and served as a chaplain. He was President of Alcorn Agricultural and Mechanical College (now Alcorn State University), a historically black college located in Claiborne County, Mississippi. He taught philosophy as well. In 1873, Revels took a leave of absence from Alcorn to serve as Mississippi's secretary of state ad interim. 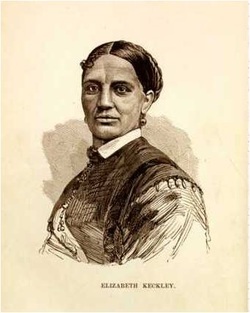 Elizabeth Keckley was born a slave in Virginia. According to her own words, she was born of slave parents. Historical writings tell that her father was Colonel Burwell, the plantation owner. She lived a very hard life but came to be a grand dressmaker. She wished to be free from slavery and one of her patrons, Mrs. Le Bourgois (luh BOOR zhwah) in St. Louis came to her rescue and raised the money. Elizabeth was thirty-seven years old and on the day of her release which was November 13, 1855, she accepted the money as a loan and worked earnestly until it was all repaid in the amount of $1200. After about five years she moved to Washington D.C. where she built up a very grand business to some of the most important ladies of which one was Mary Todd Lincoln. When President Lincoln was assassinated Mrs. Lincoln immediately called for her confidante*, Elizabeth, to come to be with her. Within a few weeks Mrs. Lincoln moved to Chicago and insisted her friend go with her. She stayed for a while and then returned to Washington and opened her own dress shop.